On September 13, 2017, a local media news channel aired a surveillance video from the murder scene of Antoine White who was killed on April 28, 2017. Several witnesses came forth and identified the suspect as John Edward Morgan, B/M 19 year’s old. The suspect was currently in jail on another charge when Homicide detectives secured a warrant for his arrest for the murder of Antoine White. Morgan is in jail for Murder with a $250,000.00 bond. Through the course of the investigation, detectives recovered video surveillance regarding a person of interest in the homicide of Antoine White that occurred on April 28, 2017 at 1800 Kingsley Drive. The person of interest is described as a black male between 25 to 30-years-old, 5’11’ to 6’00” tall, weighing approximately 170 pounds. The individual was wearing a military style backpack and has a skin abnormality on his right forearm. 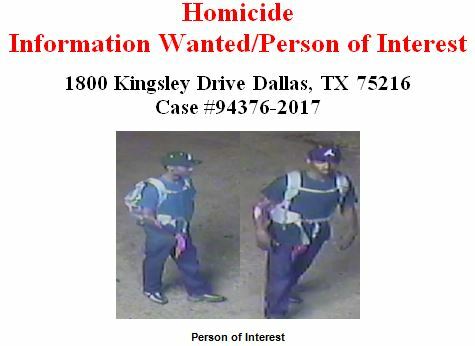 Anyone with information regarding the identity of this person of interest is encouraged to contact Homicide Detective Stewart at 214-671-3635 or timmy.stewart@dpd.ci.dallas.tx.us. On April 28, 2017, at approximately 4:10 a.m., officers responded to a shooting call at 1800 Kingsley Drive. Upon arrival, officers observed the victim, Antoine White, a 37-year-old Black male, shot multiple times and lying on the street. A passerby observed the victim and called 911. Homicide, Crime Scene and the DCME’s office responded to the scene. A canvass of the area revealed that shots were heard between 2:00 a.m. and 3 a.m. but 911 was not called. Detectives located family and next of kin was made. A murder offense was made on case number 094376-2017. Anyone with information regarding this offense is encouraged to contact Homicide Detective Timmy Stewart, 5214, at 214-671-3635 or timmy.stewart@dpd.ci.dallas.tx.us.